This post has already been read 2020 times! Finding a talented collegiate swimmer from a small town isn’t unheard of – Peitz’s teammate Andrea Werner graduated from Oakland-Craig, another school without a swim team – but it’s definitely uncommon. That’s what makes UNK such a unique place, O’Connell said. Students come to the university to get a great education, and they also have the opportunity to pursue other passions – no matter where they’re from. Peitz grew up in Hartington, a community of about 1,500 residents in northeast Nebraska, and started swimming competitively at age 11 through a local summer recreation program. By high school, the sport was her main focus. “I loved it,” Peitz said. There was one problem, though. Hartington doesn’t have an indoor pool, so swimming is strictly a seasonal activity. Peitz got past that obstacle by joining a USA Swimming club team in nearby Yankton, South Dakota, when she was 14. “That’s when I really got going,” she said. During the school year, Peitz raced from classes so she could make the afternoon practices in Yankton, a 30-minute drive from her hometown. “As soon as the bell rang, my mom was in the car waiting for me,” she said. 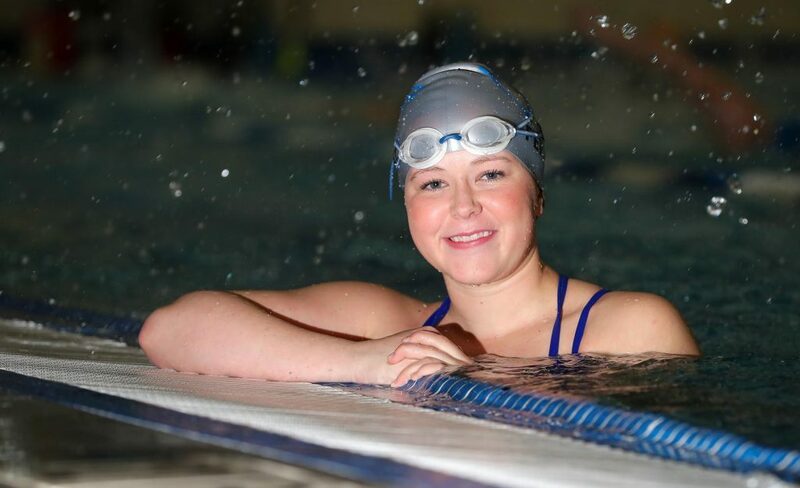 As a senior, she drove herself to practice and sometimes spent the night with a teammate so she could swim again in the morning before returning to Hartington for school. “Coming from a small town, I really had to fight to stay with the sport. 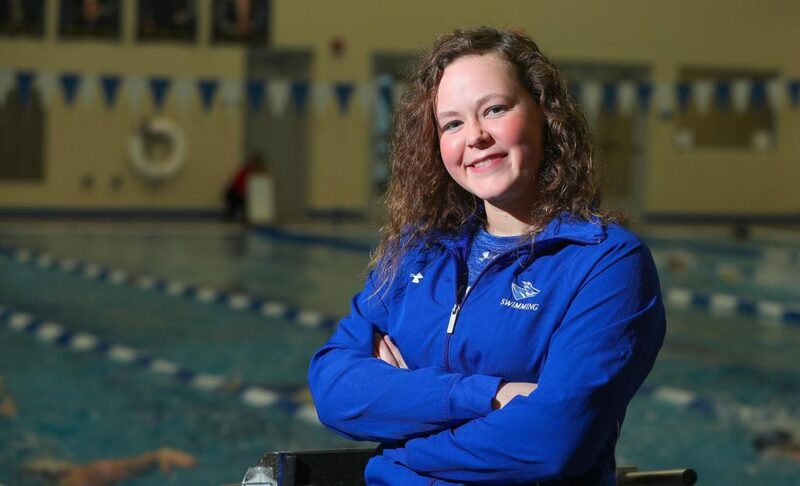 It was a big commitment to make that jump to swimming year-round,” said Peitz, who also participated in volleyball, track, cross country and cheerleading during high school. Although she loved being in the pool, the Hartington-Newcastle graduate never really had a goal of swimming in college. 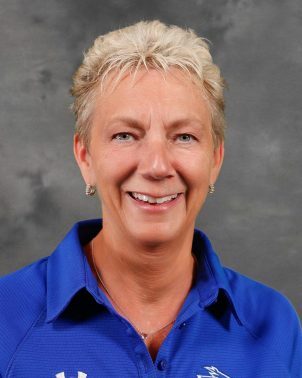 She came to UNK mainly for the recreation, park and tourism management program, with Division II athletics serving as an added bonus. The junior has excelled in the water, posting three times that rank in the top 10 in UNK history, and she’s a leader outside the pool. What’s particularly impressive, O’Connell said, is Peitz’s maturity. That characteristic was strengthened by her time as a coach. 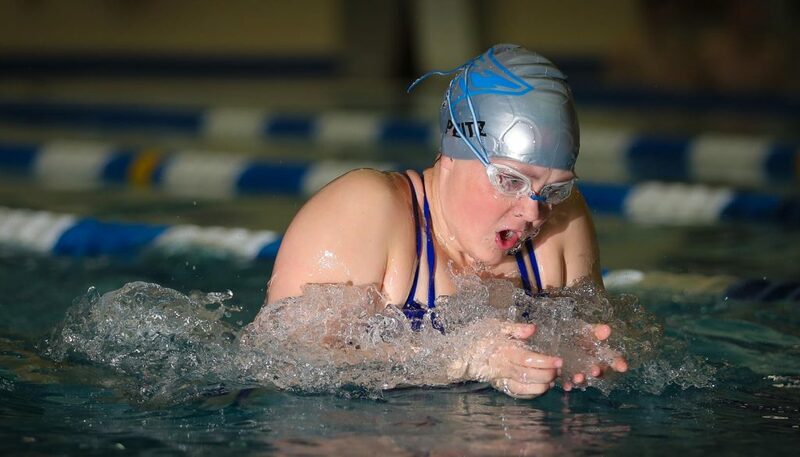 The past two summers Peitz returned home to work with young swimmers in the programs where she got her start, and she traveled to California and Arizona last semester with a Yankton Swim Team member competing in Paralympic events. “I absolutely love coaching and I’m ready to share my knowledge and pass it on,” she said. Unfortunately for O’Connell, that means this is likely Peitz’s last season as a Loper. She plans to graduate in July or December – after completing an internship – and forgo her final year of eligibility. Peitz wants to use her degree to pursue a career in recreation management and ensure many more youths have the same opportunity she had. The UNK swim team will compete Jan. 26 at the Western State Triangular in Gunnison, Colorado, and Feb. 13-16 at the Rocky Mountain Athletic Conference Championships in Lewisville, Texas.